September 15 is a Day of Action in regard supporting the Dominos drivers! 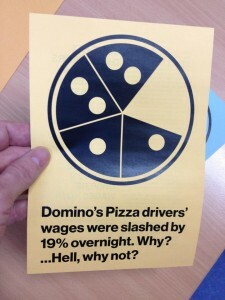 The ASF is calling on all sections of the International Workers Association (IWA), their friends and supporters to take protest action around the world on September 15 in support of the campaign for wage justice for delivery drivers who have had their wages cut 19% arbitrarily by Domino’s Pizza Enterprises management. ASF-B (Brisbane metropolitan affiliate of the ASF) ASF-M (the Melbourne metroploitan affiliate of the ASF) are organising actions on the same day.